The following document was obtained from the public website of a city in the State of New York. 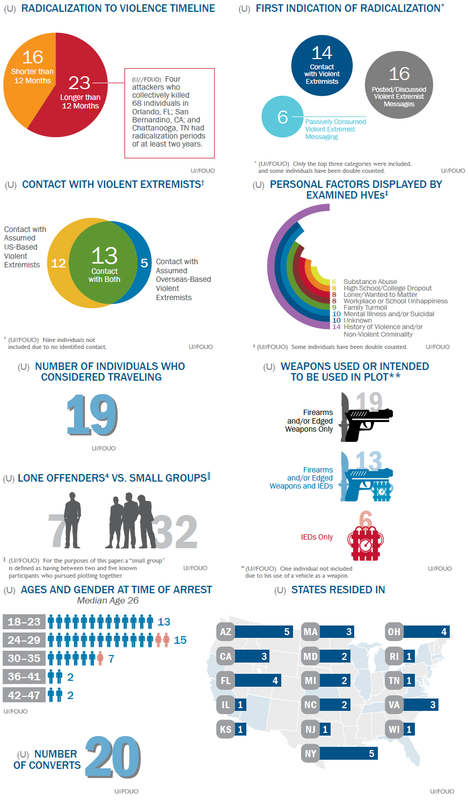 (U//FOUO) This Reference Aid is based on I&A’s review of the radicalization to violence of 39 US homegrown violent extremists (HVEs) who either successfully carried out or were arrested before attempting to carry out attacks in the Homeland between 1 January 2015 and 31 December 2016. It is intended to inform federal, state, local, tribal, and territorial counterterrorism, law enforcement, and countering violent extremism (CVE) officials. 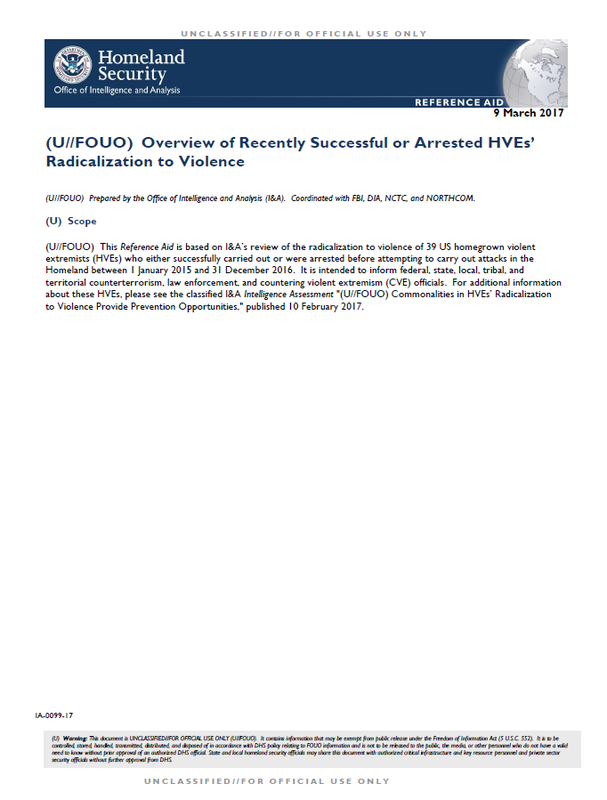 For additional information about these HVEs, please see the classified I&A Intelligence Assessment “(U//FOUO) Commonalities in HVEs’ Radicalization to Violence Provide Prevention Opportunities,” published 10 February 2017. (U//FOUO) I&A reviewed the radicalization to violence of 39 US homegrown violent extremists (HVEs) who either successfully carried out or were arrested before attempting to carry out attacks in the Homeland between 1 January 2015 and 31 December 2016. We found that 23 of the 39 HVEs—including the lethal Orlando, San Bernardino, and Chattanooga attackers—took more than 12 months to radicalize to violence. The most commonly observed initial signs of radicalization were posting or discussing violent extremist messages, contact with US or overseas-based violent extremists, and passively consuming violent extremist media. (U//FOUO) I&A assesses most HVEs prefer mobilizing with like-minded individuals, given that 32 of the 39 HVEs examined pursued plotting with friends, associates, and/or family members. In their plotting, HVEs showed a preference for simple weapons, such as firearms or edged weapons, over improvised explosive devices. Nineteen of the examined HVEs previously exhibited aspirations to travel overseas to support violence, but either failed to act upon or achieve this goal.